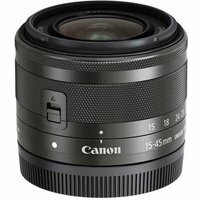 A perfect match to the EOS M10, at a weight of just 130g the Canon 15-45mm f/3.5-6.3 IS STM zoom lens is a take everywhere, travel companion. Whether you're shooting portraiture, up-close, or far off landscapes, with a versatile 24-72mm (35mm equiv.) focal length you can capture a wide range of images without the need to switch your lens. For capturing all the action, the lens includes a 3.5 stop optical Image Stabiliser (IS) for improved image quality and reduced camera shake. If you're a budding videographer, the stepping motor technology (STM) provides smooth and near-silent focusing whilst filming.